I’ve got so many stories about my time in Colombia. Some of it will have to wait until the statute of limitations passes. Some of it is a blur. I was crippled by soroche, struck down by the flu and found myself in the middle of Colombia’s national holiday. A holiday that had missile-launcher-toting soldiers on DR650’s patrolling the streets. A lot of it feels like a fevered dream. But I’m here to talk about the inaugural Custom Built Show Bogotá. It’s kind of insane to think this – but it’s the first custom show run in Colombia. In a country of nearly 50 million people and in the third biggest city in the Americas. It’s amazing to think that something like the Custom Built Show Bogotá (CBS) hasn’t been attempted before. Especially considering the amount of motorcycles in the country. They’re everywhere. There’s people commuting. Running errands. Working. People of all shapes and sizes on every kind of bike you can imagine. Sports bikes, nakeds, trailies, smoking old two strokes and countless fluorescent police riding two up on DR250s. 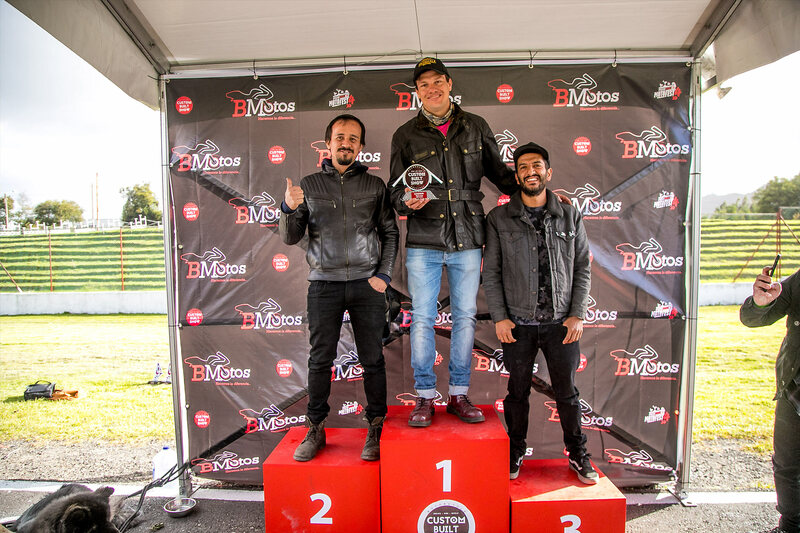 Motorcyclists are an ingrained part of Bogotá traffic, weaving their way between the heaving, swerving mass of cars that clog the streets. 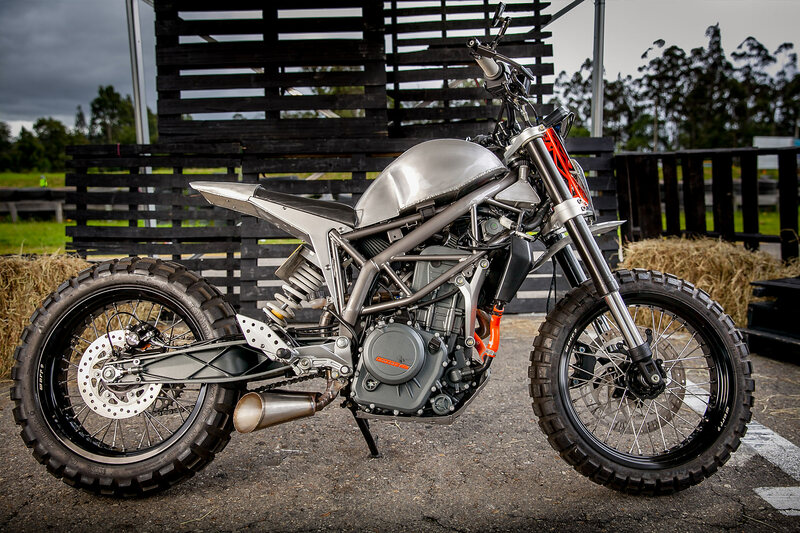 But amazingly, custom motorcycles just aren’t a thing there. People often view a bike as a practical necessity. They’re cheap to run. Cheap to insure. They can make good time through the constant stop-start traffic. But in no way is any kind of customisation a widespread thing. There’s rarely an aftermarket exhaust in sight, let alone a serious attempt at a custom build. Enter the Custom Built Show Bogotá. The brainchild of two local Bogatarians, Camilo Ramirez and Andres Pinillos, the CBS aims to bring together the formative figures in the custom motorcycle scene in Colombia and surrounds. 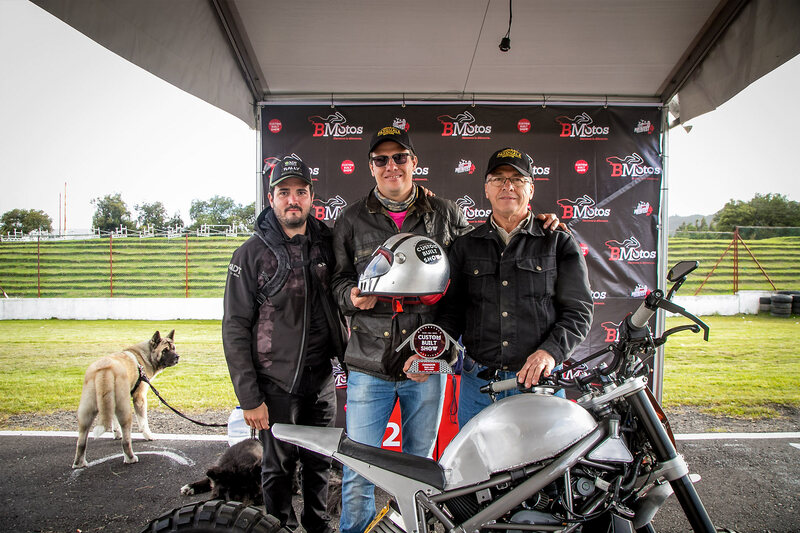 The intention is to give them a platform to show off the work they do and make the Colombian public aware that motorcycles can be damn good-looking as well as a practical purchase. It’s all helped along by a host of shops that are opening in and around Bogotá. They vary in size and technical ability, but they’re all trying to do something a little different. 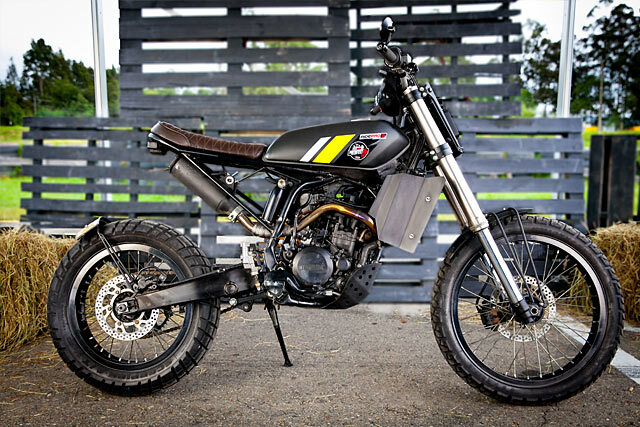 Trackers, Mad Max-esque dirt bikes, streetfighters and cafe racers all seem to be built with little influence from the outside world. Part of that is because, quite honestly, they don’t have a hope in hell of getting the donor bikes the rest of us get. 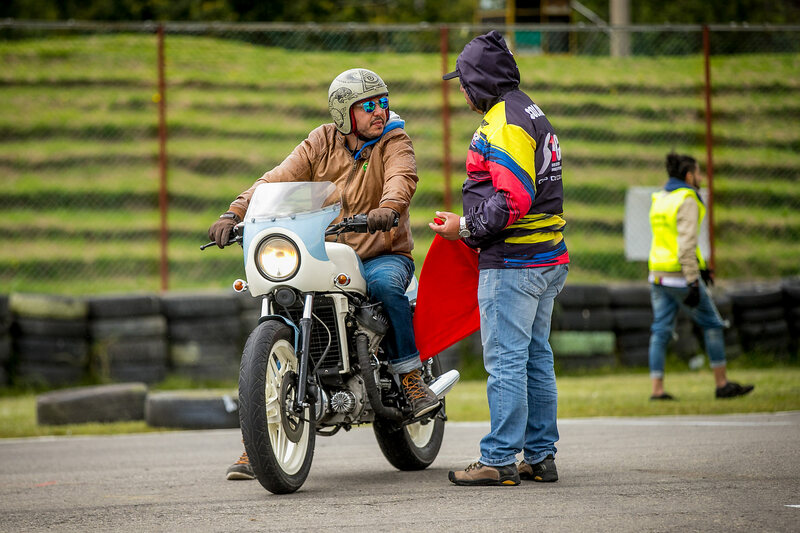 There’s no huge stockpile of classic Japanese or European bikes in the country. There’d be less than thirty CB750’s in the entire city of 8 million people. There’s a smattering of airheads, a few shovelheads but not much more than that. So finding an interesting base for a custom is an adventure in itself. And if you’re in Colombia and do manage to find a suitable donor – odds are it’ll be absolutely fucked. I mean completely fucked. Years of isolation, a lack of spares and a dedicated dealer network means most old bikes there are ruined. Not only are they mechanically run down and rusting away they’ve all suffered years of bodge jobs and haphazard repairs. It means anyone who is attempting to restore, say, a 75/6 BMW will have to budget for a complete engine tear-down. Even something as stoic as a K100 isn’t going to be a solid, reliable bike. It’ll likely require a lot of work. I was standing inside one small shop, L-Trece Customs, and the owner was gesticulating around the workshop towards an old BSA. “I found an air compressor piston in that one,” he sighs. Added to that, finding the raw materials for a premium end build is near-impossible. High grade alloys are virtually non-existent. 6061 Aluminium can be bought at a prohibitive price, but it’ll come in a whopping 2 inch thick block that will need to be cut down to be workable. Welding supplies are expensive. English wheels are almost non-existent. Three phase power is as rare as an honest cop. 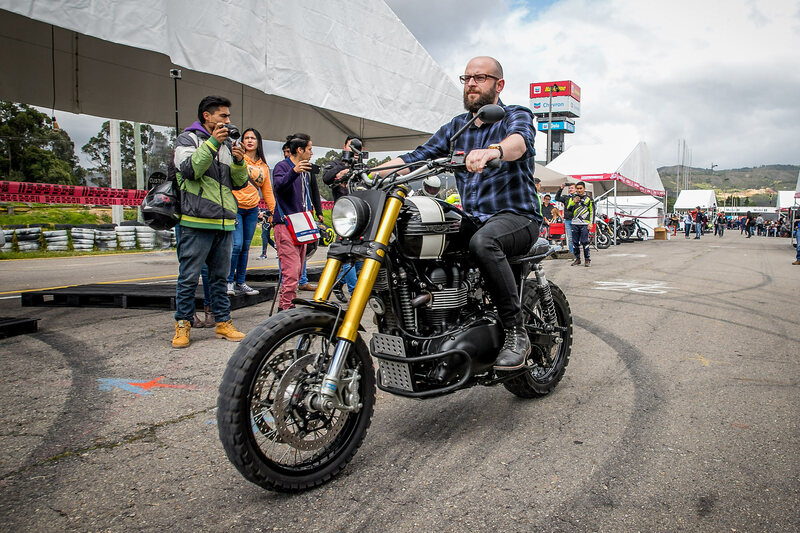 So every bike you see on display at the Custom Built Show Bogotá is the result of seriously hard work. 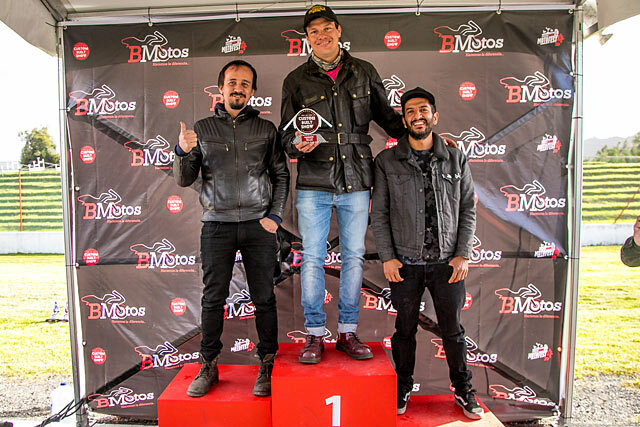 These guys have dedication in spades and the ability to overcome hurdles that would make many bike builders in the west give up before they even started. Camilo was my guide for my time in Bogotá, and the guy who paid for my flight over to judge the entries in the show. He ferried me around town in his huge black Chevy Tahoe. “It looks like a government car,” he says, “people tend to get out of your way.” We visit Lolana motors, a staple of the scene, and the owner shows me around his shop, bouncing with enthusiasm and a thick SoCal accent. We go to Paddock Motorcycles, a scooter shop that’s just starting to do motorcycles. His bread and butter is racing Vespas. I nearly wet myself laughing at his daily rider, a heavily worked PX that revs to eight million RPM and has an engine life measured in hours. “It surprises a lot of motorcyclists,” he grins. That afternoon we visit a few more shops and at one point I struggle to get the door of the Tahoe closed. It’s damn heavy. “You’ll need to really push it,” Camilo says, “the whole vehicle is bullet proof.” I spend the rest of the day tapping at the inch-thick glass and wondering if it makes me feel safer or not. That night Camilo and the team run a press event to drum up visitors for the custom show. 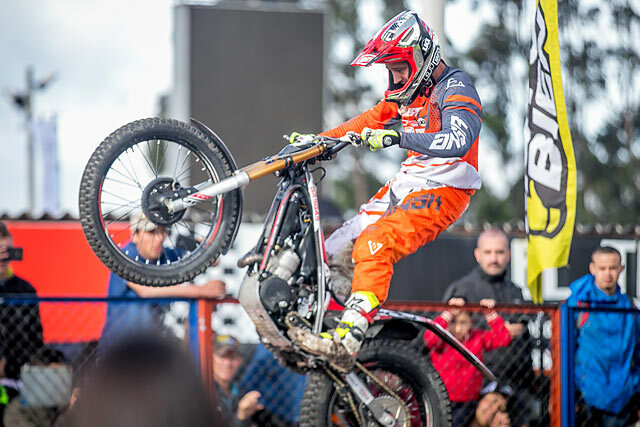 Australian stunt rider Jack Field does circles around a news presenter on a trials bike. At some stage a microphone was thrust in my hands and I was interviewed on the national news about the upcoming show. I pose for a hundred photos and am inexplicably asked for autographs. Set under the umbrella of the Motofest, the Custom Show sat alongside the general insanity that comes with any kind of trade fair set in the developing world. Motofest itself is a fairly typical motorcycle show. It featured the normal booths, Kawasaki, Yamaha and Suzuki, aftermarket parts, and plenty of helmets and jackets on display. It’s all fairly standard fare. But occasionally there were kinks in the appearance of the whole thing. It might be the rescue dogs up for adoption next to the aftermarket exhaust supplier. The grid girl doing the rounds clutching a piglet. The paramedics on DR250’s taking turns dinking (that’s Aussie for two-up on a bicycle) three-year olds around on their handlebars. I thought the whole thing was hilarious. Sat alongside this is the CBS, where music blared from an impressive speaker set up, and mountains of food and beers were on sale. The crowd moved in to look at the motorcycles that had been entered. People stared and took photos and wandered around the tents, googling at the motorcycles on display. 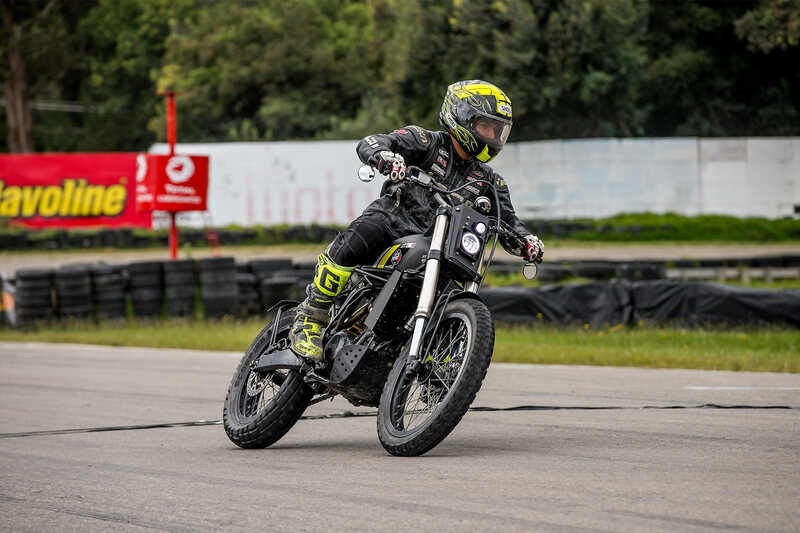 Possibly the greatest thing I saw over the weekend was many of the custom motorcycles being raced around a short course set up next to the show. Several builders wheeled their bikes down off the pallets, under the tape and right onto the course. 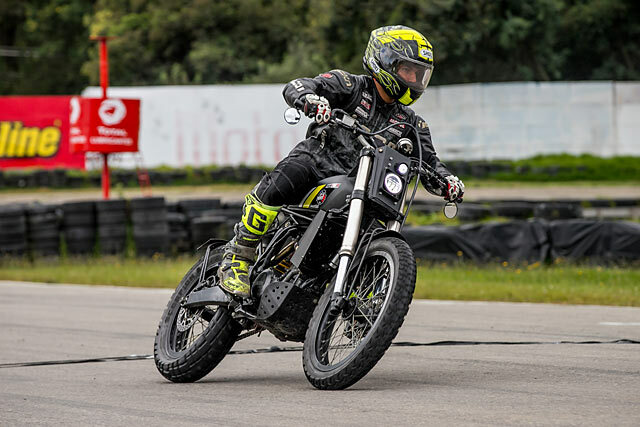 There were plenty of bikes being muscled around – R9T’s, Thruxtons, a modified WR250 and a throng of scraping Royal Enfield Himalayans. 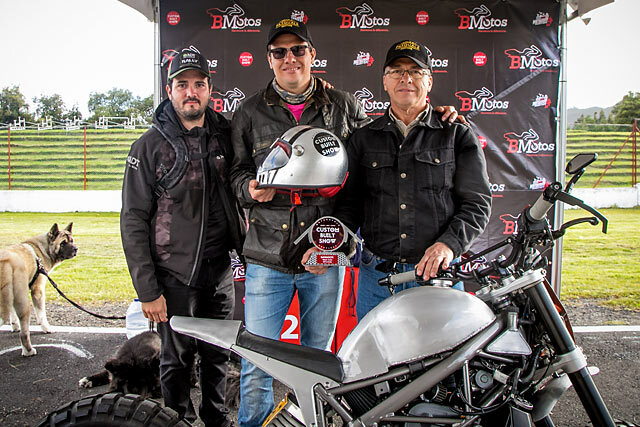 But at the end of the day little could best local favourite Fabian Gonzalez, who smashed the 400cc division on his ultra light weight RD400. 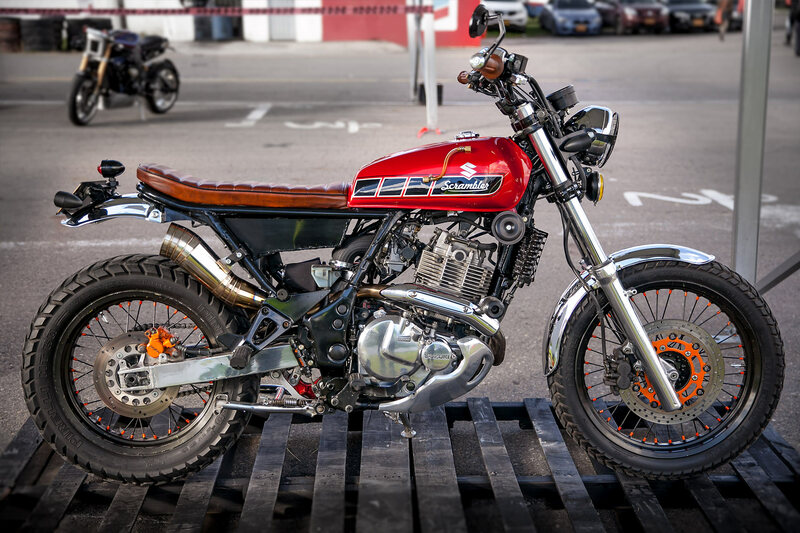 The Custom Show drew out a surprising amount of entries – especially when considering how new the scene is and that this was it’s inaugural show. Every workshop of note in town was represented. And, given the circumstances they work under, the results were really damn good. While there was plenty of creativity on show there could only be a few winners. On the end of the second day the builders gathered around to hear my announcement of the winners. With the help of an interpreter I gave a little pep talk about the hurdles they’ve all overcome and the excellent work that they still manage to build. I was tired and home sick and rambling. At some stage I might have said something about the collective strength of the Colombian psyche. At the end of my talk I wasn’t sure if I was getting ready to present an award or lead an invasion of Venezuela. 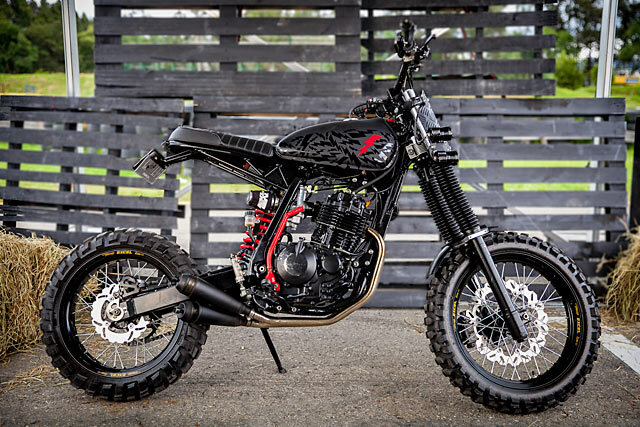 I had to give a particular shout out to Samurai Customs, a one-man operation who builds bikes in his spare time. His Suzuki Freewind featured a hell of a lot of hard work and countless hours spent polishing engine covers. Of particular note is the seat – which he upholstered himself. That’s the second seat he’s ever made. Not bad ey? 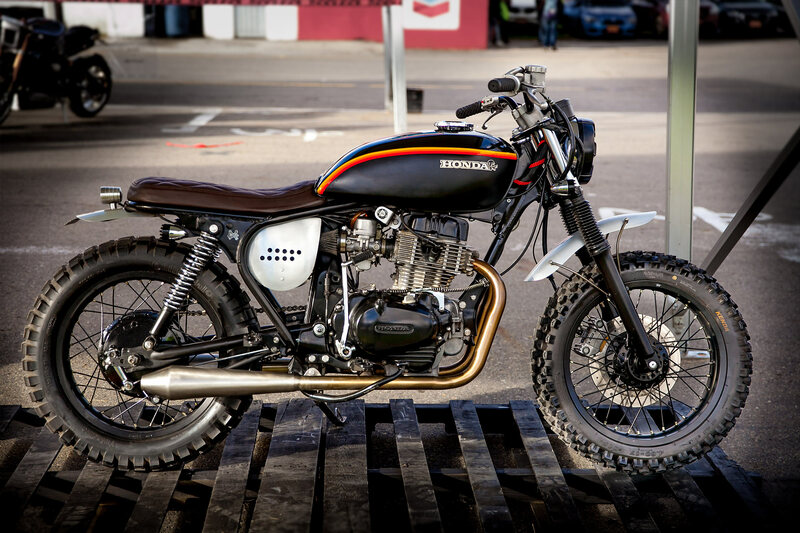 Third place went to a CB450 made by L-Trece Customs. It’s a daily rider for his customer who uses it to blast around the sketchy backgrounds of Colombia. There’s something so damn cool about this bike when taken as a whole – it’s stance and presence on the road. Probably my favourite thing was the exhaust system. The owner/builder of L-Trece, Edison Valencia, made the best looking and sounding exhaust system I’ve seen in action. This Ace Custom Shop bike is nuts. 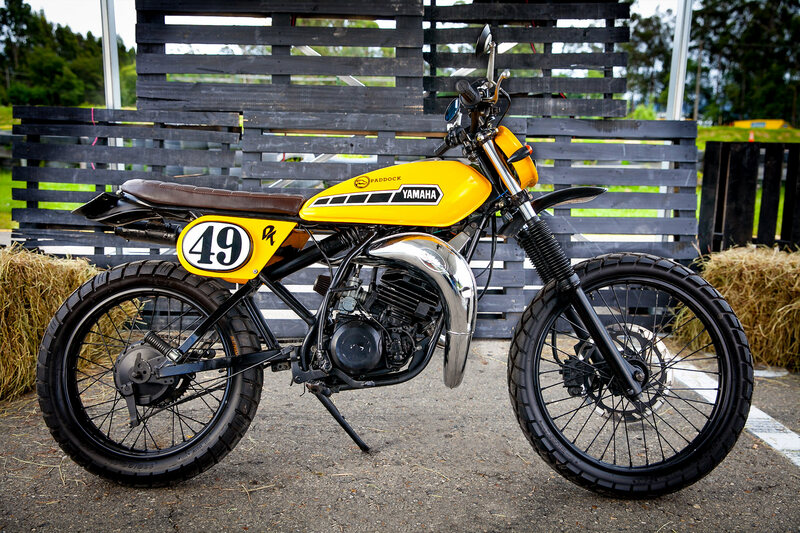 It’s an old XR400 Honda commissioned by a customer who wanted one that looked ‘badass’. And he got it. This thing wouldn’t get bail based on its appearance. 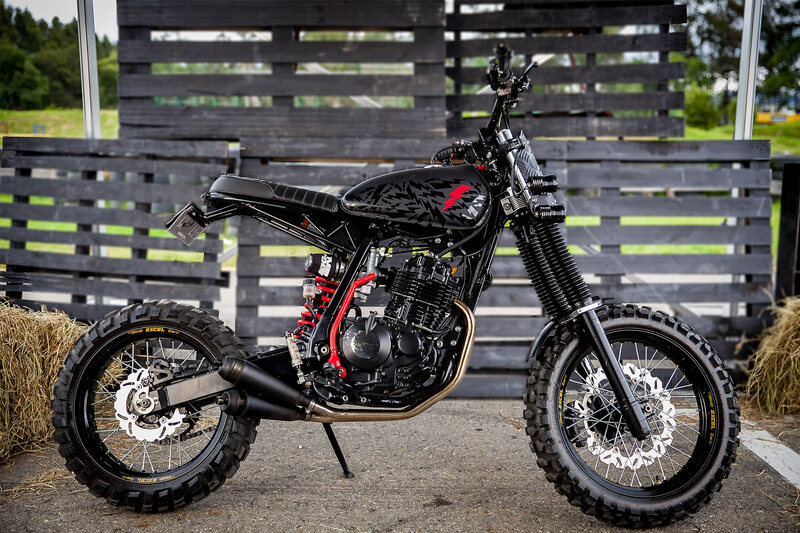 It’s had the subframe heavily modified, the electrical system tidied up with some Motogadget parts, a whole heap of black-on-black paint applied and through all that, has lost none of its rideability. And the owner does ride it – off-road and often. He even manages to race it, with the custom XR having lost none of it’s commendable dirt chops. There’s something really damn cool about a custom motorcycle that still manages to be ridden hard. Photos don’t do Pasquale Motors’ KTM 390 Duke justice. This bike was actually finished a few years ago and has been used as a promotional bike by the company that commissioned it. There’s a bunch of stuff going on here, so you’ll have to humour me. First up is the fuel tank, which is actually in two halves. The front is the tank itself while the rear holds the airbox. The electronics are hidden away and the subframe is the end result of a hell of a lot of hard work with aluminium – chiefly eyeballing a slab of alloy and cutting it in two with a bandsaw before filing it and filing it and filing it until it was even. 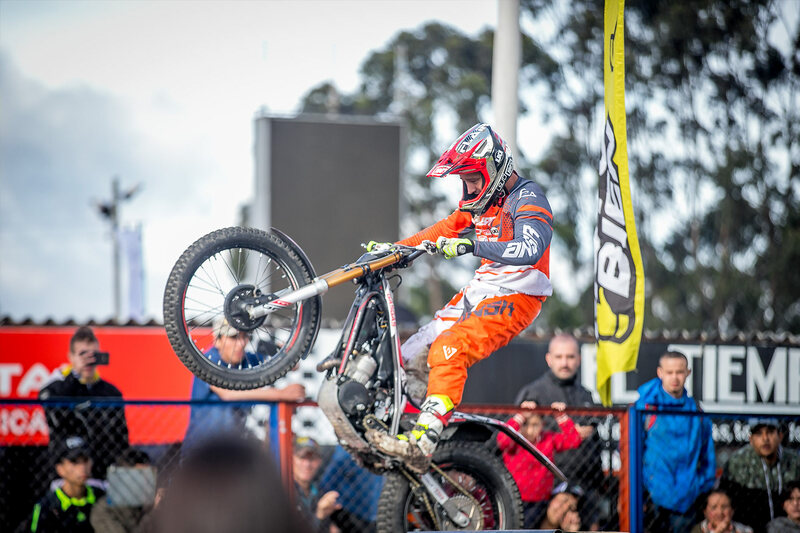 The Custom Built Show Bogotá is a pretty exciting event for the guys in Bogotá, Colombia, and Latin America as a whole. Colombia is a place rapidly changing. It’s becoming increasingly westernised, progressive, safe and moving towards bigger and better things. In the only the last few years custom motorcycle shops have been appearing with increasing regularity. I really think that the combination of improvisation, inventiveness and creativity that seem to be inherent Colombian characteristics the custom scene here will be one to watch in the coming few years.